The second-generation Audi Q5 2018 SUV is offered with a new 2.0-litre 190PS diesel engine in India. 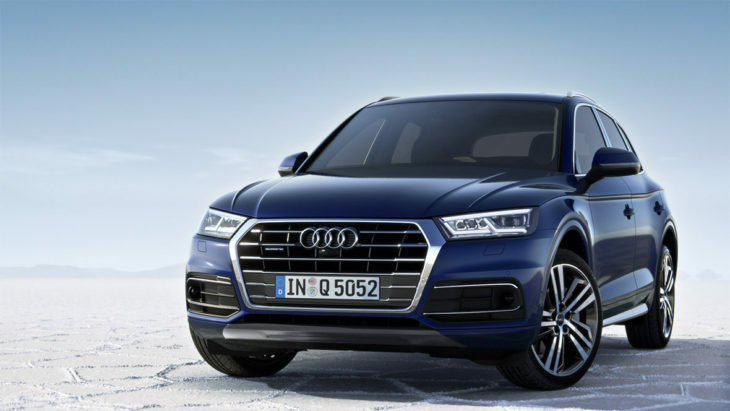 Audi, the luxury carmaker, has launched the next-generation model of its Audi Q5 SUV in India at Rs 53.25 lakh (Ex-showroom, Delhi). The compact SUV is based on the parent company’s MLB Evo platform, which also underpins its bigger cousin, the Audi Q7 SUV besides the A4 and A5 sedans. With respect to dimensions, the new Q5 has grown in every aspect and looks more imposing this time around with those elevated figures. The new Audi Q5 SUV gets a 2.0-litre diesel engine which pumps out top power of 190PS and a peak torque of 400Nm. Mated to a 7-speed dual-clutch automatic transmission, the vehicle has a four-wheel drive type setup. This engine is rated to be more powerful and efficient than its predecessor. It sprints from 0-100kmph in a matter of 7.9seconds with a top speed of 218kmph. The new Audi Q5 mileage now reads 17.01kmpl – up by 2.8kmpl from the previous gen model. The front fascia of the Q5 SUV now appears similar to the bigger, Q7, while the sides remind you of the older Q5. The LED DRLs grabs your attention at front along with the hexagonal grille, while the rear highlights include LED tail lamps with dynamic turn indicators and dual exhaust pipes. The exhausts you see are faux; the real ones are hidden under the bumper. Step inside the new Q5 and you’ll be welcomed by a typical Audi cabin. The dashboard layout and 12.3-inch virtual cockpit instrument cluster appear familiar. It gets a 7-inch infotainment screen and Bang & Olufsen sound system. The three-zone climate control, wireless charging points and adequately cushioned seats add to the convenience factor. The new Audi Q5 SUV takes on the Volvo XC60, BMW X3, Mercedes-Benz GLC and Lexus NX 300h.